I’m the one who cooks and makes the grocery lists 95% of the time in my house. We have a budget for food and I have found a few tips on how to stay under budget over the years, while eating healthy. Over and over I hear how expensive it is to eat healthy… Check out my tips on eating healthy without breaking the bank. First and foremost, shop sales. There are very few things that I will pay full price for. There are several store flyers that I check each week when I am making my meal plans and shopping lists. For example, if chicken is on sale then I stock up. I don’t buy it if it’s not on sale. And don’t forget your coupons! Frozen or canned fruit and vegetables are much cheaper then buying fresh. I can buy a bag of frozen strawberries for $3 instead of a pint of fresh berries for $5. Some people believe fresh is always best, but frozen and canned are excellent choices too. Frozen may even be healthier, when the food is flash frozen it preserves all the nutrients fresh produce loses when transporting the produce to the store. Invest in a water filter. It’s a lot cheaper then buying bottled water, and you can buy water flavoring instead of buying juices. It’s cheaper and way healthier. Soups are pretty inexpensive to make and can last you through the week if you make a big enough batch. Buy less meat. Get your protein from beans! Beans are much cheaper and have just as much protein AND beans have fiber! Think meatless chili, chickpea shepherds pie, etc. There are so many yummy bean recipes out there! I’m not saying cut out meat completely, just cut back. Don’t buy name brand. Almost every store has a ‘no name’ version and it’s cheaper 99% of the time! Pastas/rice are generally more expensive when you buy whole wheat, however they will fill you up more – so you eat less. When cooking a soup or stew, try to add less meat and more veggies. Make sure you are eating the correct portions, if you have leftovers save them or freeze them for another day. Buy in bulk when you can. It will be much cheaper in the long run. You can easily buy beans, nuts, flax meal, coconut oil, etc. in a bulk food store. I only need to buy a small amount of coconut oil at a time, maybe a cups worth, and I only pay $3. Try to get all your groceries at once. Make a list and stick to it. I find if I need to run to the store for something we tend to pick up extras. Plus, you end up spending more money on gas. Shop the perimeter of the store. Stay out of the aisles that are full of cookies, chips, and empty calories. Meal Plan! This is the best and biggest tip I have. Plan your meals so you know what to buy and what you are making on any given day. By creating a meal plan, you know what you are shopping for and you won’t end up wasting any food. You can also save money by upping your water intake – this will keep you full for longer and prevent snacking. Also, make sure you aren’t grocery shopping when you are hungry, this tends to make us pick up ‘extras’ we don’t need. 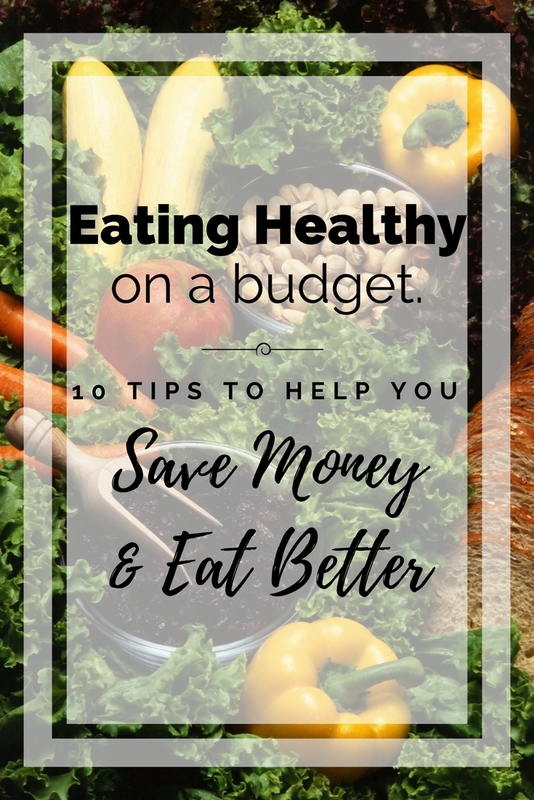 I would LOVE to here your best tip on eating healthy while sticking to a budget! Let me know in the comments below! Great tips. I always shop in the perimeter of the supermarket and get out quick before I get the urge to buy something naughty. Yes! The perimeter of the store is where you want to buy 80% (or more) of your groceries!